The network Gender and Development in Practice (GADIP), WIDE+ member, and the University of Gothenburg organized a conference on 20 and 21 March 2014 in Sweden. The conference was comprised of five keynote speeches, three workshops, and a concluding panel discussion with all the keynote speakers. The speakers and participants discussed many different aspects about the gendered impact of the economic crisis in Europe. The WIDE+ newsletter presents a summary of the debate. A common theme in the conference was an exploration of the detrimental impact of cuts to the welfare system and public services as a result of the austerity policies implemented in Europe to address the economic crisis. In particular, the cuts have affected the social infrastructure, education, health, childcare, and pensions. These cuts tend to affect women more than men for two principal reasons. First, because care-related work generally employs more women, cuts in these sectors tend to have a larger impact on their employment. Second, because in the patriarchal system women take responsibility over the (unpaid) reproductive sphere, their workloads increase as fewer care services are provided by the state. Sourmaidou illustrated the way the crisis has affected women using the case of Greece. It has also impacted women in positive ways. The burden of work for women has increased due to austerity policies and many women have become the primary household bread-winners. Sourmaidou argued that this situation has changed the image of women’s work as being secondary, and has encouraged men to take a larger share of the responsibilities at home. Gálvez Muños showed how the crisis has had negative effects for in particular women in Spain. It reinforced mechanisms of control over women in the Spanish society. She highlighted an increase of gender-based violence and an increasing justification among young women that this type of violence is a way of caring, such that the violence is seen increasingly as being socially acceptable. Unlike Greece, even if women continue working and men are unemployed the sexual division of labour within the household had not changed and women remained primarily responsible for reproductive work. Björnberg presented challenges in Sweden where policies have taken a neoliberal turn, driven by ideology more than by the economic crisis. One example is the increased flexibility of labour leading to irregular work schedules, temporary contracts, and “work on-demand” situations which often also bring lower income. Since childcare facilities are adapted to standard work hours, single mothers are especially affected along with immigrants and young persons. A common concern throughout the conference was the necessity of understanding how the neoliberal capatalist system works because although it has created the crisis, it is societal overconsumption and debt that is blamed for the crisis within the political discourse. The speakers agreed that this collective sense of blame and guilt leads people to accept austerity policies despite their harshness. Not only are people told that they are to blame for the crisis but they are increasingly made responsible for matters that were previously the responsibility of the state. In order to move forward from this paralyzing situation and begin to take action it is necessary to question both the system and the economic policies put into practice to solve the crisis. Gálves Muños gave an overview of the way in which the financial system creates and promotes debt, inequality, and crisis. She showed how the debt crisis is not a new condition, but a moment that the political and economic elites have used to promote their interests. The crisis has enabled the financial elite to make drastic cuts in welfare and employment, empowering the financial institutions and disempowering states and ordinary people. For example in the United States, 99% of recent growth has benefited only 1% of the population. She explained that the economic system has shifted from one focused on full employment and empowered workers in the 1960’s, to a system where financial capital has appropriated the power. Moreover, Gálves Muños stated that nowadays the category of proletariat needs to be changed to one of precariat that illustrates the increasing precariousness of most working conditions due to the flexibilization of the labour market. The crisis is presented as being caused by both private and public overspending and the accumulation of debt—debt that now must be repaid. However, there is no empirical evidence that proves that debt stops economic growth and models that have been used to link debt to a lack of growth have been shown to be wrong. Historically, no country has ever been able to pull itself out of a crisis through saving—all crises have been solved with lending and public spending. Salboral Martín illustrated how the image of romantic love further urges us to consume in pursuit of happiness and success. To Salobral, the notion of romantic love is built on two opposed and complementary identities—one that is entrepreneurial and active in the economic arena and the other that is caring and providing. Their success is measured in consumption, and as the anxiety to reach the ideal family motivates consumerism, more debt is incurred. This capitalist ideal is constantly supported in cultural presentations such as commercial films. More importantly, the image of the self-sufficient couple moves reproductive work from the public to the private, as being able to take care of your own children is a measure of success. This, in turn, makes invisible the reproductive work that is carried out predominantly by women. Harcourt added to this by pointing out that financial capitalism is not a social perspective but a strictly economic perspective privileging only productive activities and the economy. From this perspective, the effects on women are discussed in order to include women in the official economy and gain recognition for the unpaid reproductive work that women do. This can have two consequences: it portrays the women as more vulnerable and in need of protection, and by focusing on bringing women into the official economy contributes to the economic narrative of the productive subject and prevents us from finding alternative economies or ways of living. During the conference the speakers presented several strategies to spread knowledge and think outside the capitalist narrative. Harcourt proposed a politics of place, a concept she has explored with Arturo Escobar and that is based on people’s resistance at the micro-level. This enables an understanding of the financial system from below. By starting from where people are, they are able to create viable alternatives based on the knowledge, experience, and capabilities of themselves and the people that surround them. In this way, the politics of place can create a counter-narrative and show that people are much more resilient than the capitalist narrative would have them believe. 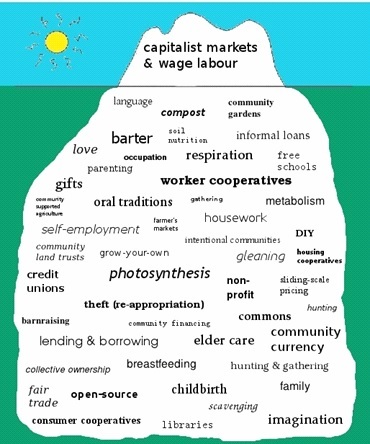 To illustrate the economy of real life, Harcourt uses the image of an iceberg. What is visible above the surface is the capitalist economy as the only existing alternative. However, when one looks beneath the surface there are multiple alternatives and strategies to sustain life. To emphasise that there are possibilities within the crisis, Harcourt uses the example of Bolsena, a small village in Italy where people live with each other on the basis of what they are able to exchange. Similarly, as was discussed in the workshop on Ways of Economic Empowerment, there are specific initiatives in Spain where women have organized cooperatives using the social economy as a strategy to enact a feminist vindication whereby the economic sphere is placed in a secondary position and people and their satisfaction is prioritized. These are specific examples of economic empowerment, understood as the freedom to make choices about how one wants to live and work. The creation of cooperatives and collective ways of organising one’s life is not always an action sprung from economic necessity or a lack of alternatives but it’s a new style of life. Salobral presented a workshop-based strategy developed within the Feminist Commission (started in 2012) of which she is a member. They developed creative strategies and metaphors to talk about and reflect on the crisis as well as to change the perception of the participants about themselves as indebted subjects. One of the strategies/methapors was to use a shiny bow tie. The bow tie was proposed as a representation of male power within the liberal system since it is an accessory worn by bankers. However, the intention was to change its standard colours and instead use a shiny purple fabric in order to transform it into a symbol of beauty and femininity and thus make it into an object of desire that reflected the pressure of capitalism to consume. Consequently, the bow tie symbolises the cycle of indebtedness and consumption because it’s an ornament, an object of status that dresses, but at the same time, like debts, strangles the neck of the consumer. Using this kind of metaphor, people become conscious that they have been manipulated into seeking happiness through indebtedness and consumption and then into bearing part of the blame for this debt, and of this crisis. Using these kinds of symbols helps women to understand that they should not feel guilty for the debt situation. This, in turn, helps indebted subjects to overcome the fear and the feeling of failure that hinders the possibilities of resistance, activism, and the finding of creative alternatives. The issue of how to mobilize and the characteristics of contemporary mobilizations were discussed by both the keynote speakers and the participants during the presentations and the workshops. The general consensus was that mobilization today looks very different from what it looked like during the 1960’s and 70’s in Europe and in the 1980’s in Nigeria and Mexico. The traditional strategies of mobilization included educational elements aimed at changing politics or the government with a clear discourse and leadership. Although these movements are still in force, new kinds of movements are taking place, especially among young people. These movements are often independent and spontaneous, motivated as responses to specific situations and organised through social media. They lack clear leadership, which makes them appear fragmented and without a clear goal. The effectiveness of social media for organizing mobilizations and the reactive nature of them was illustrated by examples from Sweden and elsewhere. One case illustrated was a national mobilization to protest against the beating of a feminist by members of a racist group during an International Women’s Day demonstration in Malmö. Adding to this discussion, Gálvez Muñoz stressed the need for people to become “more political” by voting and mobilizing in the streets in order to reverse the trend of declining interest in elections observed in both Spain and Greece. Nevertheless, as Sourmaidou stated, there is still hope. In Thessaloniki, a referendum on the privatization of the water will soon take place. This is important as it marks the first time that the government has asked for public opinion on a decision and also the first time that different organizations from both civil society and academia have acted together. Reflecting on the heterogeneity of the current social movements, Harcourt argued that power is accessible and present in everyday activities. She proposed to start a transformation away from the messiness present in the disconnect between the various small movements and towards taking advantage of their common although ambivalent critique of capitalism. She explains that this ambivalence is generated by the lure of the capitalist system. On the one hand people see capitalism failing as it creates inequalities and destroys the environment. On the other hand, they see it promising individual fulfilment and happiness. This generates a fluctuation between being part of the system, trying to ‘fix’ it, and trying to create alternatives to it. To sum up this discussion, there was a consensus in the final panel that these heterogeneous movements have more common than divergent elements. Also the discussion within the workshop “The Role of Women in Crises and Conflict” stressed the need to form alliances and define a clear goal of mobilization despite the fragmented and heterogeneous nature of the movements and the multiple spaces for action. Concerning the difficulty of developing alliances, Harcourt stressed the importance of changing the prejudice against dialogue with political and economic elites. Likewise, Jarl identified academics, politicians, and activists as key actors for the creation of alliances. Gálvez Muñoz agreed with the relevance of being present in every place “where power decides our future”. Harcourt included the economic business schools as another strategic entry point, since they shape the mainstream discourse about the crisis and the strategies to address it. Salobral Martín reflected on the dilemmas of networking with political parties that claim to sympathize with feminism yet may still engage in corrupt practices or promote agendas that contradict their interests, such as supporting the criminalization of abortion or ignoring LGTBQ issues. These difficulties make clear the diversity within the feminist movement and the need to adopt an intersectional approach when establishing these alliances. Therefore, despite these difficulties, Salobral Martín stated that this heterogeneity needs to be emphasised consciously and constantly, and that the alliances should not try to homogenize the feminist movements. Moreover, Harcourt and Gálvez Muñoz agreed that feminism as well as gender needs to be addressed as a transversal category. The conference concluded that much more work is necessary in order to understand better the problems women are facing as a consequence of this crisis. However, there are new experiences and new alternatives that have to be explored and made known if we are to continue to construct any kind of resistance that can confront the gendered consequences of this crisis and the policies that sustain them. This report was elaborated by Linn Hultgren and Natalia Fernanda Múnera Parra, master’s students at the School of Global Studies and revised by Ulla Björnberg, senior professor at the Department of Sociology and Work Science and Edmé Dominguez, associate professor at the School of Global Studies, University of Gothenburg. The summary of the report is prepared by Gea Meijers. Posted on May 2, 2014 July 2, 2017 by wideplusnetworkPosted in Analysis, Conferences, Feminist Economic Literacy, Gender justice in Europe, Reports and PublicationsTagged (Socio-)Economic Alternatives, Feminism in Action, Feminist Economic Literacy, Neo-liberal Economic Policy.